When I was thinking about their cake toppers I knew I wanted to make something a bit more arts-and-crafty, so I pulled out my streamer stash and started brainstorming. I just love streamers! Whenever I see them I always ask myself “should I get these?” and think “yes, yes I should.” “You know, just in case I need them at some point.” Sometimes I actually do get them. Sometimes I talk myself out of it and decide that once I start using up my current stash I’ll get more--unless I see a kind of steamer color I don’t have yet and love! I think what I love most about them is how versatile they are while also being a super easy decoration to put up that can have a big impact, like my DIY Halloween Streamers tutorial! I designed the cake toppers on paper first, toying with a few different ideas, and I’m happy to say they both turned out as planned! Both tutorials are quite straightforward and very fun to make! This cake topper, in particular, feels nostalgic. Like when you're a kid and you make the tissue paper, pencil, and glue projects, like this. I used to love those! It’s like coloring: a repetitive task that’s creative and relaxing. And It’s good for you! If you’d like to go as far as to say this cake topper is good for your health, you go right ahead--I'd agree! Now onto the nitty-gritty--if you could call it that. 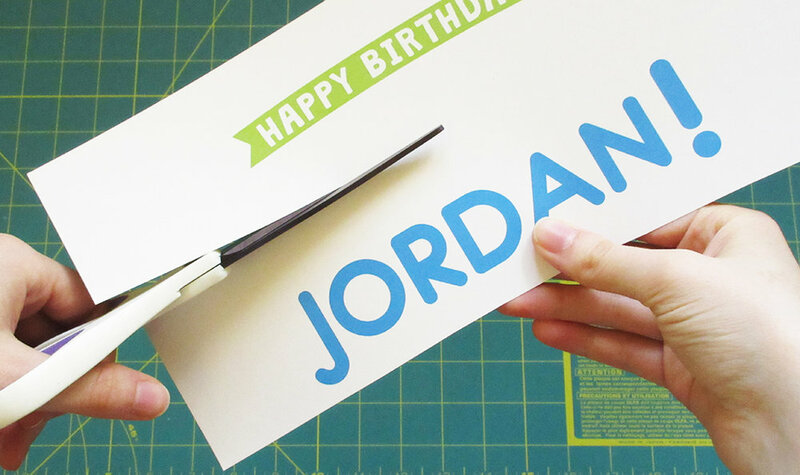 For Jordan’s cake topper I went into Adobe Illustrator and chose a font I liked and made a simple banner. To make this tutorial as easy as possible I’ve included a printout that has the ABCs and 123s in the font and size I chose. Although mine is in color, for the printout I simply made it white lettering with a black line for cutting it out. Feel free to color in the letters with a marker or colored pencil to match your streamer color so that there are less noticeable gaps--if any. You could also choose your own font and coloring using something like Microsoft Word, it’s up to you! First, if you’d like to use my printout, download it by clicking the download link below. I do ask, if you download my printout, please keep it for personal use only. If you're using my template, start by printing out the template on cardstock and coloring in the letters/numbers with your streamer color. As mentioned above, you can also use a program like Microsoft Word and find a font, size, and color you like! To cut out the center of the O, R, D, and A I used an X-ACTO knife, but if you don't have one you could use scisors. Now that everything is cutout it's time to start cutting the crepe paper streamers into squares! I cut plenty of streamer squares and had a bunch left over (that I saved). You could also cut them as you go, it's up to you! Once you have some cut you're ready to start shaping the pieces. All you have to do is fold the square over the chopstick (or pencil), fold the sides down, and pinch it to help it keep its shape. Wrap, fold, pinch, repeat--until you have a bunch! 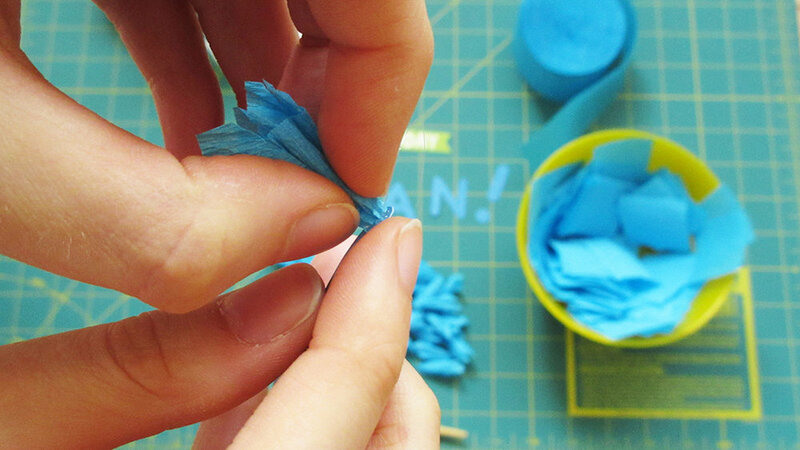 Now simply apply a bit of hot glue to your little piece and glue it to your letter! Don't worry about spacing too much, a bit of a gap will help the pieces stand nicely together. First letter done! It's so pretty! Now it's time to glue the skewers to the back of the letters. 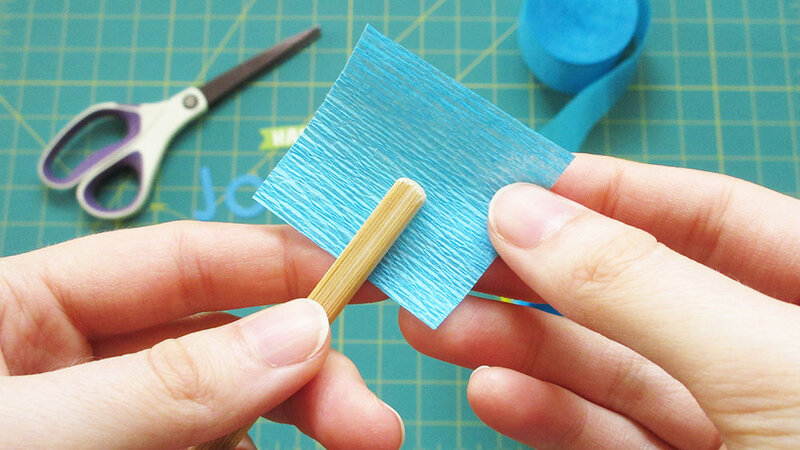 You don't need much hot glue, a thin strip or even a dot will do. This is how I spaced out the exclamation point pieces. Before you place all the letters into the cake you might want to cut the skewers so that they're only 3-6 inches long and can stick into a cake easily without hitting the bottom. Do you have any birthday months? Where it feels like a lot of birthdays going on in quick succession? Do you have any same-day or the next day birthdays? I'd love to hear! I hope you guys enjoyed this post and get a chance to make this cake topper for the next cake you make! Happy crafting!